Gore Vidal on Bush’s Inaugural Address: “The Most Un-American Speech I’ve Ever Heard” | Democracy Now! As we continue our discussion of President Bush’s inaugural address. Let’s hear a portion of that speech. President Bush, inaugural address January 20, 2005. AMY GOODMAN: As we continue our discussion of President Bush’s inaugural address, let’s hear a section of that speech. PRESIDENT BUSHAmerica will not impose our own style of government on the unwilling. Our goal, instead, is to help others find their own voice, attain their own freedom, and make their own way. The great objective of ending tyranny is the concentrated work of generations. The difficulty of the task is no excuse for avoiding it. America’s influence is not unlimited; but fortunately for the oppressed, America’s influence is considerable, and we will use it confidently in freedom’s cause. AMY GOODMAN: President Bush, his second inaugural address. Today we’re joined by Gore Vidal, one of America’s most respected writers and thinkers. Author of more than twenty novels, five plays. Author most recently of, Dreaming War and Perpetual War for Perpetual Peace. His latest book is, Imperial America: Reflections on the United States of Amnesia. Yesterday we caught up with Gore Vidal and I asked him his reaction to the inaugural address. GORE VIDAL: Well, I hardly know where to end, much less begin. There’s not a word of truth in anything that he said. Our founding fathers did not set us on a course to liberate all the world from tyranny. Jefferson just said, “all men are created equal, and should be,” etc, but it was not the task of the United States to “go abroad to slay dragons,” as John Quincy Adams so wisely put it; because if the United States does go abroad to slay dragons in the name of freedom, liberty, and so on, she could become “dictatress of the world,” but in the process “she would lose her soul.” That is what we — the lesson we should be learning now, instead of this declaration of war against the entire globe. He doesn’t define what tyranny is. I’d say what we have now in the United States is working up a nice tyrannical persona for itself and for us. As we lose liberties he’s, I guess, handing them out to other countries which have not asked for them, particularly; and what he says —- The reaction in Europe— — and I know we mustn’t mention them because they’re immoral and they have all those different kinds of cheese — but, simultaneously, they’re much better educated than we are, and they’re richer. Get that out there: The Europeans per capita are richer than the Americans, per capita. And by the time this administration is finished, there won’t be any money left of any kind, starting with poor social security, which will be privatized, so that is the last gold rush for (as they say) men with an eye for opportunity. No, I would have to parse this thing line by line and have it in front of me. It goes in one ear and out the other as lies often do, particularly rhetorical lies that have been thought up by second-rate advertising men, which are the authors of this speech. It is the most un-American speech I’ve ever heard a chief executive give to the United States; and thanks at least to television, we were given every inaugural from Franklin Roosevelt on (and it’s quite interesting to see who said what), and only one was as gruesome and as off-key as this, and that guy is Harry S. Truman, who’s being made into a hero because he fits into the imperial mode. He starts out his inaugural — we’re on top of the world we’re the richest country, the most powerful militarily, and what does he do? Within three lines Harry Truman is starting the Cold War, which the Russians were not starting. They thought they could live in peace because of their agreement at Yalta with his predecessor, Franklin Roosevelt, whose unfortunate death gave us Harry Truman and gave us the Cold War, which is now metastasized into a general war against any nation that this president of ours, if he is — was elected, wants to commit us to, and we — preemptive wars. That’s just never existed in our history, that a president — “Well, I think I’m going to take on Costa Rica. There may be some terrorists down there one day. Oh, they aren’t there yet, but they’re planning for it. And they’ve got bicarbonate of soda. Once you have that, you know, you can build all sorts of biochemical weapons.” This is just blather. Blather. And that an American audience would sit there beside the capitol or reverently in front of their TV screens and watch this and not see the absurdity of what was being said — absolute proof of a couple of things that I have felt, and most of us who are at all thoughtful feel: We’ve got the worst educational system of any first world country. We are shameful when we go abroad, because we know nothing. Just to watch the destruction of the archaeologists’ work at Babylon. Babylon is a center of our culture. Nobody knows that. Nobody knows what it is, except it’s a wicked city that the lord destroyed. Well, it was the center of our civilization, the center of mathematics, of writing, of everything. And apparently our troops were allowed to go in and smash everything to bits. Why did they do it? Was it because they are mean bad boys and girls? No. They’re totally uneducated. And their officers are sometimes mean and bad, and allow them to have a romp, as they also had in the prisons, none of which we heard about in the last election. We were too busy with homosexual marriage and abortion, two really riveting subjects. War and peace, of course, are not worth talking about. And civilization, God forbid that we ever commit ourselves to that. GORE VIDAL: Well, proof of his bad education — he seems not to know that the principle founders of the United States, from George Washington to Thomas Jefferson to Madison, were all slave holders. So, we started a country with half of the country quite prosperous because of black slaves, African slaves, who were not in the least happy about being slaves, but they had been captured, brought over here and sold back and forth around the country. So, I don’t see how the founding fathers could have committed us to the principle that 'no man should be a slave, and every man should be a master,' or whatever the silly-Billy said. Well, this is a country based on slavery, is also based upon the dispossession of what we miscall the Indians. They were the native Americans, at least before — long before our arrival. So, we were not dedicated to any of these principles. We were dedicated to making as much money and stealing as much land as we could and building up a republic, not a democracy. The word democracy was hated by the founding fathers. It does not appear at any point in the constitution, nor does it appear in any pleasant sense in the Federalist Papers. So, we are not a democracy, and here we are exporting it as though it were just something — well, we just happened to make, a lot of democracy, and cotton and tin and stuff like that. So, let’s —-let’s do some exports of democracy. We don’t have it, and most countries don’t have it, and not many countries want it. Democracy was tried only once, and that was in the Fifth Century B.C., at Athens, and finally, they were overcome by an oligarchy from Sparta, and nobody ever tried again to establish a democracy in any country on earth. And if any history had been taught to the cheerleader from Andover -— I’m ashamed that I even went to the brother school Exeter nearby, where at least we were taught enough history not to make gaffs like that in public. GORE VIDAL: Oh, what bull. I notice all the help that we gave Mandela before he himself extricated his people from the white rule of the Boers and the English in South Africa. We went to great lengths to see that he was silenced, that he was not helped at any time. And we were — Is that how we stood up for other countries trying to liberate themselves? We’ve never done that. We went into the first two world wars for self-aggrandizement. We did very well out of it. We’ve gone into Latin America, and every time that there’s been a democratically elected government, from Arbenz in Guatemala in 1953 to Allende in Chile, we have played a vicious game. Sometimes we assassinate the president, sometimes we overthrow him. Sometimes — all the time, eventually, we establish a military dictatorship. We’ve been doing that for 200 years. But, for a people that knows no history, does not want to know history, with a corrupt media that will not tell you the truth about anything going on in the world, what else could we have, but a dumb, cheerleader president? 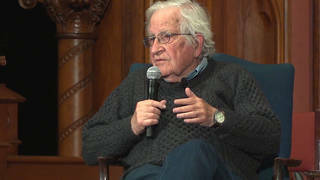 AMY GOODMAN: But if it was Franklin Delano Roosevelt who said, “democratic reformers facing repression, prison, or exile can know, America sees you for who you are, the future leaders of your free country,” would you object? FRANKLIN DELANO ROOSEVELT: I can only tell you that I feel your pain, and I know that you will be rulers one day. But meanwhile, I’m staying here in Washington, and you must look to your own future, and your own freedom. GORE VIDAL: That’s Franklin Delano Roosevelt. The fact he said that meant that he was on the side of that; but we never did anything about it. Roosevelt never made a move, even when it came to the time of great tyranny, when his state department — I must say he didn’t like it — but his state department turned away the infamous ship in which the Jews trying to escape Europe and Hitler were sent back. That’s how we helped out. AMY GOODMAN: What is your hope for the future, as President Bush inaugurated his second term with this speech? GORE VIDAL: I don’t see much future for the United States, and I put it on economic grounds. Forget moral grounds. We’re far beyond any known morality, and we are embarked upon a kind of war against the rest of the world. I think that the thing that will save us, and it will probably come pretty fast, when they start monkeying around with Social Security, that will cause unrest. Meanwhile, the costs of the wars the cost of rebuilding the cities immediately after we knock them down, if we didn’t knock them down, we wouldn’t have to put them back up again, but that would mean that there was no work for Bechtel and for Halliburton. We are going to go broke. The dollar loses value every day. I live part of the year in Europe, which is always held against me. What a vicious thing to do, to have a house in Italy; but I also have one in Southern California. We are a declining power economically in the world, and the future now clearly belongs to China, Japan, and India. They have the population, they have the educational systems. They have the will. And they will win. And we will — we only survive now by borrowing money from them in the form of treasury bonds which very soon we won’t have enough revenue to redeem, much less service. So, I put it down to economic collapse may save the United States from its rulers. AMY GOODMAN: President Bush in this inaugural address, and in his second term, can you make comparisons to Richard Nixon, and won by a landslide, much more than Bush, in terms of how he beat his opponent, and yet ultimately is forced to resign? GORE VIDAL: Well, let us hope history repeats itself, and there’s a possibility that the American people will get fed up with endless war, and endless deaths coming out — American deaths. That’s all we care about. We don’t care about foreigners dying. But that is getting on people’s nerves. I think that he thinks, and many of the American people appear to think, that we’re in a movie. Lousy movie, but it’s just a movie. And, once the final credits run, all those dead people, who were just extras anyway, will stand up and come home, or go back to the old actors’ home. It isn’t a movie we’re in. It’s real life. And these are real dead people. And there are more and more of them, and the world won’t tolerate it. So, he might very well end up like Mr. Nixon. Nixon at least when he ran again, curiously enough, was rated among the most liberal and progressive of our presidents in the 20th century. Not that he really was; it’s just that he felt domestic affairs were best left alone. Let labor unions and capital worry about that while the president prosecuted foreign wars. He loved foreign affairs because it was fun. You got to make a lot of trips and see people in fancy uniforms and hear “Hail to the Chief” in various tunes. That was Nixon’s take. And then, of course, once he got in — into war, he couldn’t get out. Didn’t try very hard to get out. He wanted to be victorious. Well, he wasn’t victorious. Then he lied and cheated. This one lies and cheats, too. So far he’s not had his Watergate. Let us hope that there is one looming. AMY GOODMAN: Do you take heart from the opposition, from the resistance on the ground, from the grassroots protests? GORE VIDAL: Well, you know, I spent three years in the second world war in the Pacific, and I was born at West Point, and I have some affinity for the army; and what I am hearing, the tom-toms that are coming not only from those who have returned to the United States, particularly reservists, but what I also hear from overseas, is that there’s great distress and dislike of this government, and certainly of this war, which is idly done. And everybody is at risk with insufficient armature — arms, and no motivation at all except the vanity of a — of the lowest grade of politicians that we’ve ever had in the White House. They are disturbed, and I can see that there may be suddenly something coming from them once they get back home, if they can get back home. They may turn things around. AMY GOODMAN: And, in general, young people in this country protesting the inauguration, for example. More than 10,000 people out in the streets, almost — although there was almost no coverage except for Pacifica and independent media of those voices. People — hosts on CNN saying they didn’t want to 'over-exaggerate' the images that would be so easy to go to, so they just didn’t. GORE VIDAL: Or be honest about them. The famous February, a year ago, when everybody demonstrated. I spoke to 100,000 people in Hollywood Boulevard. And the L.A. Times, which is better than most of the establishment papers, said there’s just hardly anybody there. However, they were undone by the photograph taken of — when I was up on the platform at very end of Hollywood Boulevard with La Brea in back of me and way up ahead Vine Street, you saw 100,000 people. You saw what they looked like, unlike New York where they got everybody into side streets so you couldn’t see them at all in a photograph, because they just didn’t show up. So, out here, a makeup man at the Times helped the cause. AMY GOODMAN: As the Democratic Party chooses a new leader, do you have words of advice for the direction? GORE VIDAL: Remember that the United States — the people of the country have always been isolationists, a word which has been demonized, thrown out, an isolationist is somebody who believes in a flat earth and is racist and so forth and so on. Well, none of that is true. Isolationists — Most of the left in the second world war, from Norman Thomas on to Burton K. Wheeler, were progressive Americans, the very best liberal Americans were anti-war. We have never been for imperial foreign wars. We have to be dragged screaming into them, as we were after Pearl Harbor and there was a lot of machinations going on to make sure that that happened. And it goes on all the time. Events are made so horrible people like Saddam and so on are demonized, and we all have to immediately begin by saying how awful he is for 25 minutes before we can get down to the fact that he was no threat to the United States, no threat at all. He was not involved with al Qaeda. He was not involved with 9/11. He was not. He was not. You can say it a million times, but there you have a president with the help of the most corrupt media in my lifetime bouying his words across the land and telling lies about the — ’We’re 45 minutes away from being blown up by the weapons of mass destruction that this master of evil has in his hands.’ To which the answer is: Why? Why would he do that? There must be some motivation. You see, they are now beyond motivation, and that is insanity. So, an insane government is not one that you can look to with any confidence. AMY GOODMAN: Gore Vidal, speaking to us from California. His latest book, Imperial America: Reflections on the United States of Amnesia.